AT a corner bungalow lot in Jalan Ipoh, a team of young people is busy unpacking and organising the mess laid out on the front yard. On the porch, sawdust covers piles of wood and metal pieces encased in bubble wrap. There are also stacks of carpentry tools and machinery. Inside, the house is equally disorganised. More wood and metal parts are lined up against the decorated walls. In one room, there are bags, banners and belts strewn all over the floor, while electric trinkets and diesel drum chairs occupy the other. The space feels like you’ve just entered Da Vinci’s workshop or some mad man’s home. This is Harmony Hub, the headquarters of social enterprise Biji-Biji Initiative that advocates sustainable living. The four co-founders — Azam Hisham, Gurpreet Singh Dhillon, Rashvin Pal Singh and Zoe Victoria — live and work in that 9,000 sq ft bungalow which they rent for a little less than RM5,000 a month. Rashvin, a former consultant at PricewaterhouseCoopers, insists that the house is usually not this messy. The team has just returned from a project for arts and music festival Urbanscapes in Genting Highlands last December. There, it had constructed and later dismantled a massive water-harvesting structure made from discarded material. Now, Biji-Biji Initiative is preparing for another project, also at the same venue. It has been commissioned to create an art installation at an abandoned helipad using half a ton of discarded metal salvaged from the old Genting Highlands theme park. The structure must be completed before February. It has been a challenging pace for the team, running project after project. “This space is our workshop, prototype development centre, and production and storage facility,” says Azam, a musician and writer for independent music portal The Wknd. 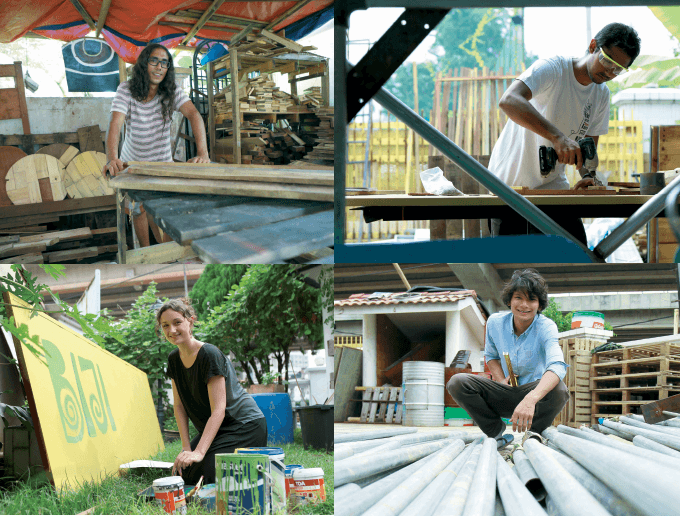 Founded two years ago, Biji-Biji Initiative has become known for its upcycling innovations, outdoor installations as well as advocacy of green technology and effective waste management. Its mission is to champion sustainable living, minimise carbon footprint and leave a positive social and environmental impact — all this while generating enough revenue to sustain itself. At the beginning, the collective received RM32,000 in seed funding from the Arthur Guinness Fund-British Council’s Entrepreneurs For Good award. That money went towards buying tools. According to Azam, Biji-Biji Initiative has become completely self-sustaining when it comes to funding its various initiatives. After all, social enterprises are a kind of hybrid business. These ventures have to balance their social aims with a business model that can help them stay funded. 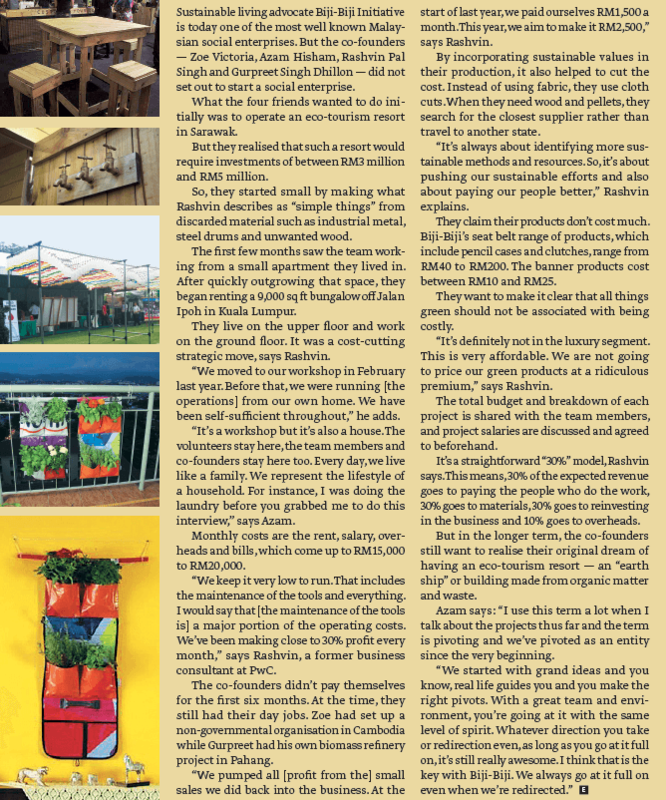 Azam adds that in two years, the team has generated over RM500,000 in sales, mostly from commissioned projects, outdoor installations and selling upcycled furniture. Last year was undeniably a big year for Biji-Biji Initiative. The team gained corporate jobs from clients such as Hong Leong Foundation, Genovasi Malaysia and Guinness Foundation. It also took part in the Live in Levi’s campaign alongside Sheila Majid and Marina Mahathir. To wrap up the year on a bigger note, Biji-Biji Initiative won the grand prize of RM250,000 in the Alliance Bank SME Innovation Challenge 2014. It was the only social enterprise to be shortlisted and the win was indicative of a rising interest in sustainable living and social businesses. “The degree of their moral values and a sound business plan were key to me,” said the competition’s chairman judge and EcoWorld director Tan Sri Liew Kee Sin, whom the top prize is named after. Rashvin says the win was validation that Biji-Biji Initiative and social enterprises at large indeed have a viable business model. “The business world is recognising this as a completely legitimate and sustainable model. Customers and corporates are demanding business to be more transparent, sustainable and ethical. “They recognise this as the future path and we offer this model,” says Rashvin. Winning the challenge was a huge boost for Biji-Biji Initiative. It was up against five other finalists. The first runner-up was container café operator Chaiwalla & Co, which won RM150,000, while the second runner-up was online hijab seller EDZ, which won RM100,000. Rashvin says Biji-Biji Initiative wasn’t expecting to win. Biji-Biji Initiative’s plan for 2015 is simply to make its space and services more accessible to the public. When it was first launched in November 2012, sales were largely business-to-business (B2B). It aims to venture into consumer retail with 2015 as a test-and-trial year. Consumers can expect all sorts of upcycled products and accessories ranging from seat belt bags and banner bags to pipe benches, pallet tables and diesel drum sofas. The team will be operating out of pop-up stores and bazaars such as Publika’s monthly Fuyoh Art Bazaar and the likes around Petaling Jaya and Kuala Lumpur. Having more funding means Biji-Biji Initiative can invest in machinery and tools, which include a milling machine and 3D printer. Some of the funding will also go to marketing and sales. “We are capitalising on our B2B business and products to reach a larger audience, which is the B2C (business-to-consumer) market,” Rashvin says. Biji-Biji Initiative’s plan to engage more with the public ties back to its original plan. “The main idea of Biji-Biji Initiative is to influence and inspire people, to relay a… I hate the word ‘message’, but to relay an idea to Malaysians because we’ve always been concerned about the future and direction,” Azam says. Biji-Biji Initiative is also planning to ramp up production of goods while creating more demand. By mid-2015, it will open a second hub to encourage more people to come to the workshop, explore prototypes and collaborate. For now, the co-founders are tight-lipped about the location of the second workspace but they promise it will be bigger and more accessible. “Whatever we want to do, it is always very people-centric,” Azam adds. As William Blake wrote: “in seed time learn, in harvest teach, in winter enjoy”. 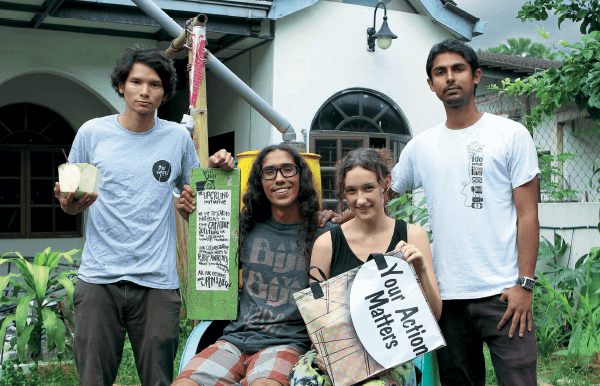 The team has planted the seeds — biji-biji — and 2015 looks optimistic for Azam, Rashvin, Gurpreet and Victoria, who share the same vision of cultivating a greener Malaysia. But they aren’t blinded by their idealism and are serious about sustaining their business in the long term. “Our primary goal is not money. Our primary goal is to champion the cause that we believe in, which is sustainability, raising awareness on reducing waste and empowering people. But this can only happen if we are profitable,” quips Rashvin. This article first appeared in #edGY, The Edge Malaysia Weekly, on January 12 - 18 , 2015.